Many cities around the U.S.A. have had drinks named in their honor. I am sure that is also true of Portland, Oregon — but none appear in the noteworthy drink books of the past. I have been coming to Oregon since the late 1960’s (as a small child). Now, I finally live here in Portland. I felt that the city deserves a drink, so I made this. This drink is more of a good drink than a deeply inspired one. My alumni will recognize that its form is fairly consistent with the Old Manhattan Cocktail of the 1880’s — but with drier, and more local, flavor. If you don’t like this one, you probably never will favor true cocktails (I refer to the historically-accurate, and historic, type of drink — not tipples, in general). Here it is. Click on the image to enlarge it. 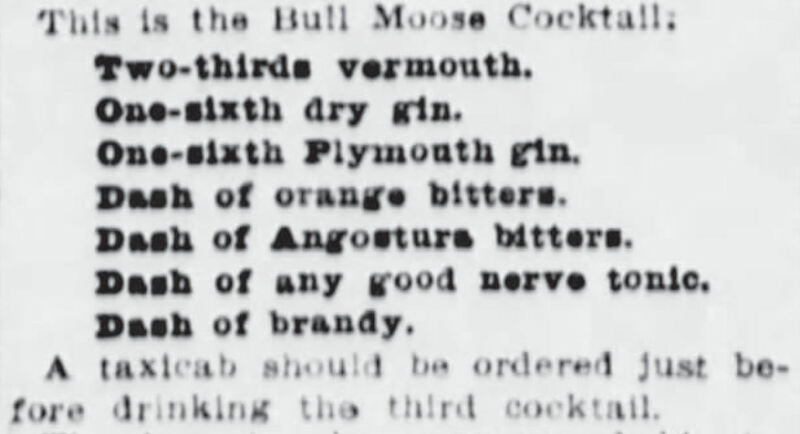 Today’s drink of the day is the Bull Moose Cocktail. The party stood for limiting the growth of corporate power and that of political contributors. It stood for making public all political contributions — and severely limiting them. The party also wanted to create of a National Health Service and stood for direct elections of U.S. senators — and for the general expansion of democracy. Like Abraham Lincoln, the Progressive Party supported the rights of organized labor unions to represent workers and act on their behalf. Unlike Lincoln, the Progressive Party proposed mechanisms to prevent labor unions from being disruptive to the economy. In a way, the founding of the Progressive party was a split in the Republican Party. Teddy Roosevelt essentially took the progressives with him out of the GOP in 1912. If you think that American history has been better with a Republican Party devoid of a progressive, pro-labor, pro-national healthcare, anti-corporate-power wing, you can thank Theodore Roosevelt for that. If you think that American history would have been preferable with a Republican Party still influenced by its progressive, Abraham Lincoln wing, you can blame Theodore Roosevelt. 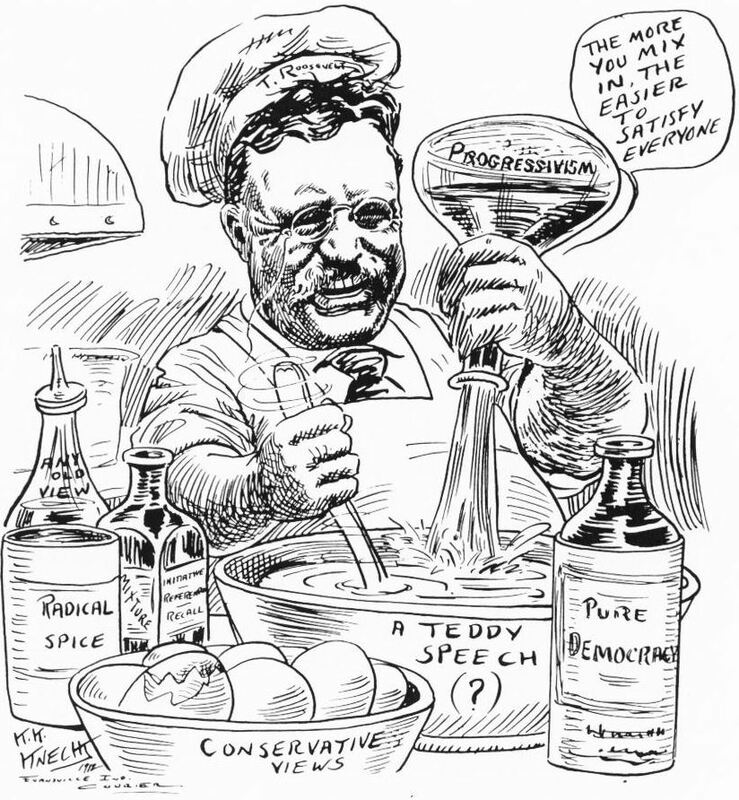 As for the Progressive Party, there was controversy right at the founding convention, when it appeared that the anti-trust (anti-corporate) position was being watered down — seemingly under the influence of Teddy, himself. In this political cartoon of the time, he is shown to be adding some of just about every political opinion into the mix, trying to keep everyone happy. Perhaps the Bull Moose Cocktail was meant to be evocative of the same critique. 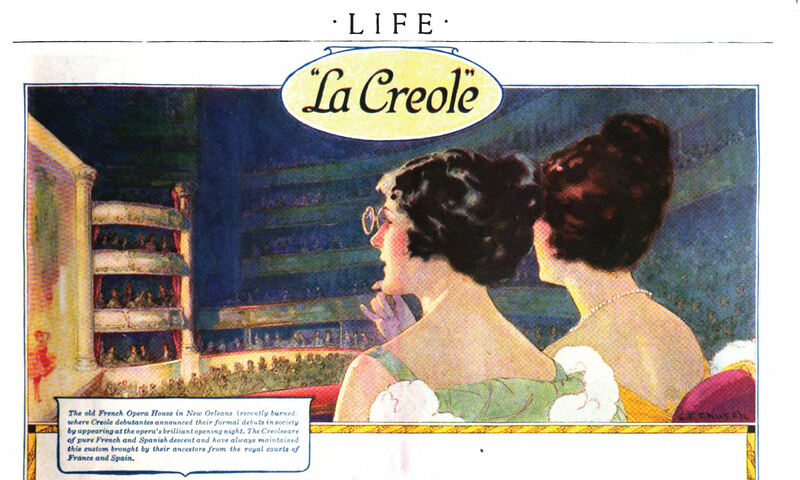 The Evening World (of New York) and the Washington Herald both published the drink, very topically, in July of 1912. It has a lot going on — but still falls within the parameters of the true cocktail (meaning the specific type of drink according to American tradition). Like the political party, the Bull Moose Cocktail did not become a lasting feature in the American landscape. It may have been too topically named for it’s own good once the moment had passed. It is an old drink, but isn’t a ‘classic,’ or even a cult, drink. That doesn’t mean you shouldn’t try one! It was published in the proportions of 1-to-2, with twice as much of the modifying, sweetening vermouth wine as the total of the two spirits. As you can see from my recipe (by clicking on the image to enlarge it), I prefer it at 1-to-1. I also prefer making the brandywine part of the jigger, rather than just a gratuitous dash. As for the nerve tonic in the original recipe, medical literature from the time suggests that nerve tonic was commonly made of cinchona. So, I use cinchona bitters (such as Campari Bitter or Aperol Aperitvo). To Jerry Thomas the word ‘fancy’ only apparently meant ‘fancy presentation’ – in this case, only by straining the drink into a previously lemon-accented goblet instead of serving it ‘on the rocks.’ Perhaps Thomas’ sense of ‘fancy’ was common at the time. If so, the meaning of ‘fancy’ would quickly come to mean less about presentation and more about constitution. All of the above sources make their fancy drinks ‘fancy’ by both presentation and by adding fancy sweeteners. Traditionally speaking, a fancy sweetener is one that also supplies flavor beyond that of plain sugar. The fancy sweeteners in the above drinks include Curaçao liqueur and maraschino liqueur. Notice that, in contrast to Jerry Thomas in 1862, none of them use fancy sweeteners in the plain versions of their drinks. Next, we will look at some pre-prohibition sources that make their fancy cocktails fancy only in essence, and not at all in presentation. In the above recipes, it can be seen that the word fancy does not refer to fancy presentation at all. These drinks are fancy in constitution only, being at least partially-sweetened by fancy sweeteners. They are not garnished or presented any differently than the ‘plain’ cocktails. 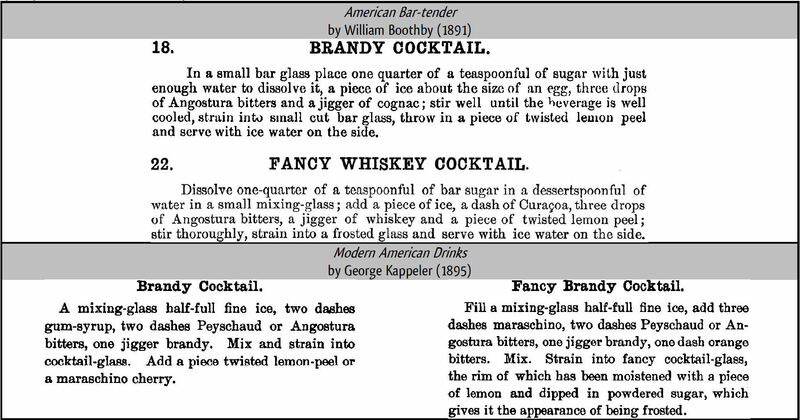 The authors of these recipes would probably have considered Jerry Thomas’ regular Brandy Cocktail of 1862 to be a fancy drink rather than a plain one. Jerry Thomas is credited with authorship of the first American book dedicated to the art of mixing drinks. That certainly does not necessarily mean that his book is the best on the subject — or even that it was an accurate representation of the state of the art in his day. But, if taken as representative, it would seem that originally, a drink was considered ‘fancy’ in an American bar if it was fancy in image by being garnished or presented in a fancy way. It also seems that the word ‘fancy’ then matured into meaning that a drink was fancy in its essence, in addition to, or instead of, being fancy in its image. Many other fancy cocktails became famous, even though not called fancy. The Manhattan Cocktail could be thought of as a fancy Whiskey Cocktail specifically made fancy by vermouth wine, which is sweet and adds other flavors. In fact, many true cocktails that have remained popular are fancy in their essence. Today’s drink of the day is the oldest known vermouth wine. How old is vermouth wine? It is older than the year 1786 on the label of Carpano’s Antica Formula [sic]. 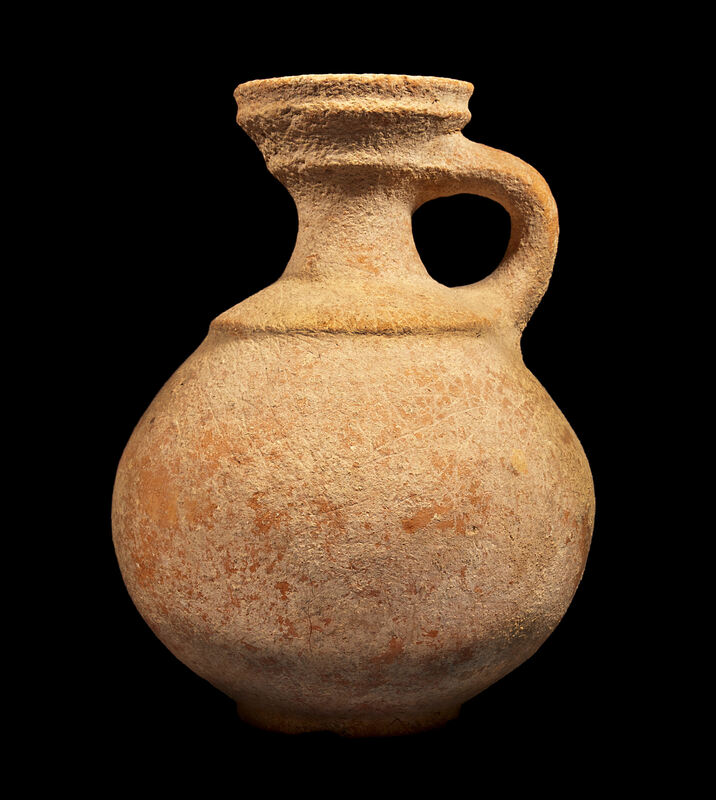 It’s even older than Hippocras wine of the middle ages — which has been recently suggested as the ancestor of vermouth wine. Vermouth wine actually dates back to ancient Rome. A recipe for Absintium Romanum is found in the cookbook traditionally attributed to Apicius, called De Re Coquinaria (‘on cookery’) That book dates back to late imperial Rome (~400 c.e. ), and surely contains recipes from earlier centuries. That is absolutely true. But, modern English idiom has it that when we use the French word, we are talking about a wormwood spirit — and when we use the German word, we are talking about wormwood flavored wine. In his 1936 translation of De Re Coquinaria, Joseph Dommers Vehling called the recipe ‘Roman Vermouth.’ His reason for doing so was very good — both on linguistic and culinary grounds. The ancient Romans made wormwood-flavored wine — or in other words, vermouth wine. That’s exactly what it turns out to be — even according to modern idiom. One can still make ancient Roman vermouth wine, with some preparation. You should be able to get wormwood very easily online. Saffron, dates and honey should not be difficult to find in a shop near you. Dried costmary leaves are the most difficult of the ingredients to obtain. When in season, you can purchase them here. Otherwise, you will need to grow some costmary for yourself. It’s worth doing so — since a few fresh costmary leaves really deliciously accent a pitcher of lemonade or a bowl of punch. Fresh costmary is equally wonderful as garniture for that great, nearly-forgotten type of drink, the cup. In 2006, I made myself a Gin Costmary Julep that was as good a julep as a julep can be (at least the way I remember it). I have never made costmary syrup, but I can think of no reason that it would be anything but delicious. It can also be a bit difficult to find mastic resin. A good Greek market should have some. Otherwise, you can order it here. It seems that the recipe instructs the use of Camerinian wine in making Roman vermouth wine. Whatever that might have been is unknown to me. A red wine would be the safest assumption.